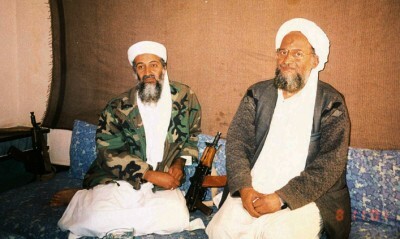 Osama bin Laden with current Al-Qaeda head Ayman al-Zawahiri, back in 2001: Foreign Policy suggests it’s time to forgive and forget. just another in a long list of examples of how the United States, largely because of poor oversight and loose financial controls, has sometimes inadvertently financed the very militants it is fighting. But is it really so inadvertent? There are indications (as noted by the blog Moon of Alabama–3/11/15) of a shift in the Western foreign policy establishment toward seeing groups like Al-Qaeda–that is, far-right terrorist groups who espouse a violent strain of Sunni Islam–not as the main targets of US military operations but as potential allies against the governments Washington has identified as more important enemies, namely Shi’ite-led Iran and Syria. Moon of Alabama (10/2/13) has previously noted a media campaign to distinguish between different Al-Qaeda-affiliated militant groups in Syria–between the Islamic State in Iraq and Syria (ISIS), for example, and Jabhat al-Nusra, described as “more clearly accepted by mainline rebels” (New York Times, 10/1/13) and “more moderate” (Washington Post, 10/1/13) than ISIS. the instability in the Middle East following the Arab revolutions and the meteoric rise of the Islamic State of Iraq and al-Sham (ISIS) require that Washington rethink its policy toward Al-Qaeda…. Destabilizing Al-Qaeda at this time may in fact work against US efforts to defeat ISIS. 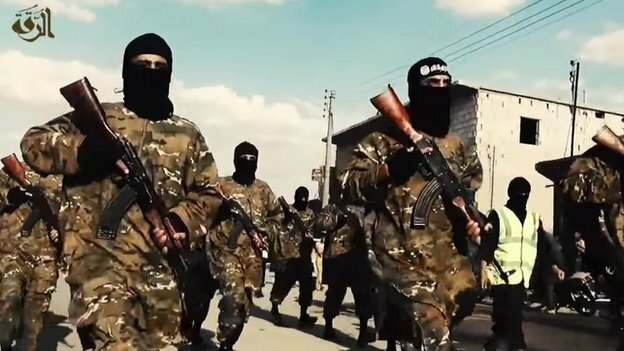 Not only can Al-Qaeda be “an important player in curtailing ISIS’ growth,” but it can help “contain Iran’s hegemonic aspirations, which threaten US allies,” notes Mendelsohn, a political science professor at Haverford College and a veteran of Israeli intelligence. Al-Qaeda’s responsibility for the single worst massacre on US soil, an attack that has served to justify 13 years of continuous warfare, was not addressed. Why bring up water under the bridge, when ISIS is clearly so much worse? Shouldn’t we at least bomb the Islamic State to smithereens and help destroy this head-chopping menace? Now I despise ISIS as much as anyone, but let me just toss out a different question: Should we be arming ISIS? Or let me ask that differently: Why are we, for the third time since 9/11, fighting a war on behalf of Iran? ISIS, with all its awfulness, emerged as the homegrown Sunni Arab response to this crushing defeat of Sunni Arabism…. Obviously, I abhor ISIS and don’t want to see it spread or take over Iraq. I simply raise this question rhetorically because no one else is: Why is it in our interest to destroy the last Sunni bulwark to a total Iranian takeover of Iraq? Because the Shiite militias now leading the fight against ISIS will rule better? Really? Well, ISIS is openly committed to a policy of genocide–not only against non-Muslim minorities like the Yazidi (New York Times, 10/21/14), but against entire Shia denomination of Islam (“Shia have no medicine but the sword” is an ISIS slogan) who make up two-thirds of the population of Iraq. Thinking that that makes ISIS a bad choice to rule Iraq requires you to think of Shi’ite Muslims as human beings, I suppose.